Chelsea coach Guus Hiddink insists his summer exit from the club won’t affect his players when they take on Liverpool in the Champions League quarter-finals on Tuesday. The Londoners have a 3-1 advantage from the first leg at Anfield, but will go into the match without captain John Terry, who has been suspended. The Blues held a light training session at Stamford Bridge on Monday. 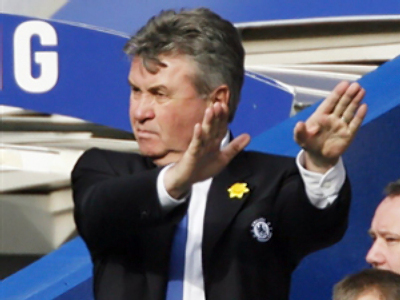 Even though Chelsea chairman Bruce Buck insisted Hiddink will not stay on as coach at the end of the season, the coach has been combining his role at Chelsea with that as coach of the Russian national team. “We prepare very seriously because a lot of people will say ‘if you win in Europe and in an away game’ like we did then you won't have any concerns about the second game. No, we are preparing professionally for this second game and we know that Liverpool are a very good team, they play beautiful football and we are very aware of that,” Guus Hiddink said. Liverpool boss Rafael Benitez could also be forced to cope with injury problems as he attempts to claw back the deficit. Captain Steven Gerrard still remains a doubt with a groin injury despite training with the team. “Stevie is a key player for us and so if Gerrard is fit, he can be an inspiration for the rest of the players. Hopefully we will see today how he trains and after how he feels – and then we will decide. He is a key player and he can score goals, he can play well and he can be a leader,” Rafael Benitez said. Liverpool have earned a reputation as the comeback kings in Europe after famously coming from 3-0 down to beat AC Milan in the Champions League final four years ago. Benitez says his team has the experience to pull off another shock. “In this moment we have nothing to lose so they will be under pressure because they have to win, but we are talking about players with experience, quality experience in the Champions League, and experience in the Premier League, so it is a question to see if we can score that goal and see what happens. But again I will say that we have nothing to lose in this moment and it is just to win,” he said.